I've got a very different interpretation of Superman from what you've maybe seen these last fifteen or twenty years. To me, Superman is the son of God and he's here quite simply to make the world a better place. However, he's as troubled as Christ was in his forty days in the wildnerness or in the Garden of Gethsemane. He knows he has this huge burden, but he's been raised to believe that his own fears must come secondary to the good of mankind. He's also the ultimate immigrant - an alien trying to fit into a system that he follows perhaps a little too much, his little human secret identity construct allowing him to mix with these ordinary people that his father sent him to save. He's a fascinating character. Christopher Reeve and Elliot Maggin nailed the multiple personality thing so clearly and perfectly that anyone could understand it. 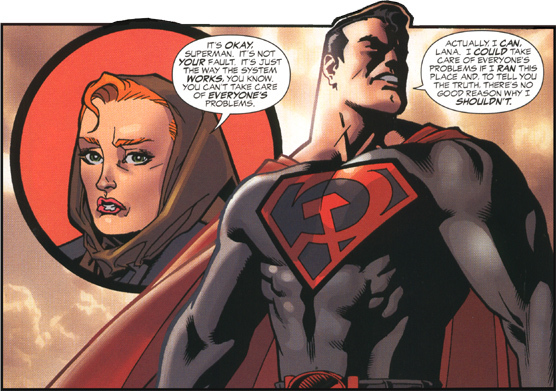 Red Son is based on a thought that flitted through my head when I read Superman #300 as a six year old. It was an imaginary story where Superman's rocket landed in neutral waters between the USA and the USSR and both sides were rushing to claim the baby. As a kid growing up in the shadow of the Cold War, the notion of what might have happened if the Soviets had reached him first just seemed fascinating to me. As I got older, I started putting everything together and I first pitched something to DC when I was thirteen, I think - although it was in a much cruder form, of course, and my drawings weren't quite up to scratch. I pitched it again when I was twenty three. Three years later, it sold and I started writing. Six months later (around half-way into the final book) I stopped writing because I saw that the art was slowing down and I didn't want to complete something that might be out of date by the time it appeared. I wanted to come at this with a fresh eye and this is what I did when Killian Plunkett was brought in to finish it around early 2002. I finished book three and then, quite recently, went back and tightened up the dialogue for the entire project. It was actually very, very satisfying. It's very, very political, very much an allegory of what's happening with the USA at the moment and a very, very mainstream project aimed at the same people who picked up the first Dark Knight book. Just as that was a commentary on the Reagan years, Superman: Red Son is an Orwellian examination of what happens when the balance of power tilts in the world and one country finds itself the only world superpower. The book is suddenly very topical and I was delighted to explore this in detail as I went back and tweaked my early drafts. I've done this more like the Golden Age Superman where the story really starts with him coming from the Russian farmlands to the big city of Moscow, as idealistic and trusting in the system as our Superman is with regards to capitalism and the American Way. I didn't want to make fun of communism because it's such an easy target. I wanted to do something more Shakesperean and start with a man who just tried to do the right thing and ended up making some terrible mistakes along the way. It's a commentary on the collapse of the Soviet Union, of course, but like the best science fiction I use it as an allegory for the world we're living in and Superman's takeover of the world with pre-emptive strikes is really a very fair dissection of what's been happening in America over the last ten or fifteen years. It's all about Empires and the fact that these monolothic structures are doomed from the beginning. It's actually a very serious work, moreso than you might expect. I wanted to write something epic. 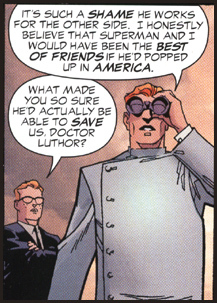 Superman is a huge character and doing something small just didn't seem appropriate. It was important to get everything I had to say about the character down on paper at the time and I wanted a very broad canvas to work on. It's one of the most ambitious Superman stories ever attempted. It owes a lot to Superman #400 too, by the way. If anyone hasn't read this, pick it up. It costs nothing and it was probably the best book DC has ever produced with Moebius, Sienkiewicz, Miller, Chaykin, Steranko all contributing. Why doesn't everyone own this? Like I said, this was something that had appealed to me since I was a kid. Reversals always make the most interesting stories. Superman, to me, was always a representation of everything great about America. He's up there with the statue of liberty because he's the embodiment of the immigrant who came to America and made a success of himself. To take Truth, Justice and the American Way and turn this on its head was fascinating. The trick, of course, was avoiding the cliches of Superman being raised as a Stalinesque tyrant or an overtly evil character. What I decided upon very early in this project was to have an idealistic young farm-boy being raised in the Ukraine and believing, with all his heart, in the goodness of communism. Just as our own Superman isn't tarnished by the Americans dropping bombs in Vietnam or Iraq, this Soviet Superman isn't responsible for the Gulags or the mass-killings. This Superman represents The Dream as much as the traditional Superman does, but watching him reluctantly take control of the USSR when the people beg him to and make communism an international success is quite fascinating. What we have, as the story progresses, is a world where this super-communism has been embraced by most of the planet and capitalism has completely fragmented. Again, a reversal of what happened in the real world. The moral implications of one man or one country policing the entire world then becomes the big question. Like Bush, Cheney and Ashcroft, Superman finds himself wondering if total control is the best thing for the safety of the people he really wants to protect. 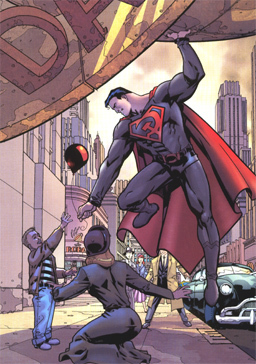 Superman: Red Son was very much my farewell to Superman because it represented everything I really had to say about the character and, inside three books, featured pretty much all the characters and concepts I loved from the comic-book series like Luthor, Brainiac, a bottle city and so on. I'd certainly never write a sequel, but I'm constantly coming up with ideas for the regular Superman books and jotting them down for future use. I've asked DC to dedicate it to Curt Swan, Cary Bates, Elliot Maggin, and Julie Schwartz.